Instant Pot Sausage and White Beans is total comfort food! Cook the beans from dry, no need to soak them. This is a smoky, flavorful, thick, rich pot of beans. You can even add some spinach or kale to bump up the nutrition. 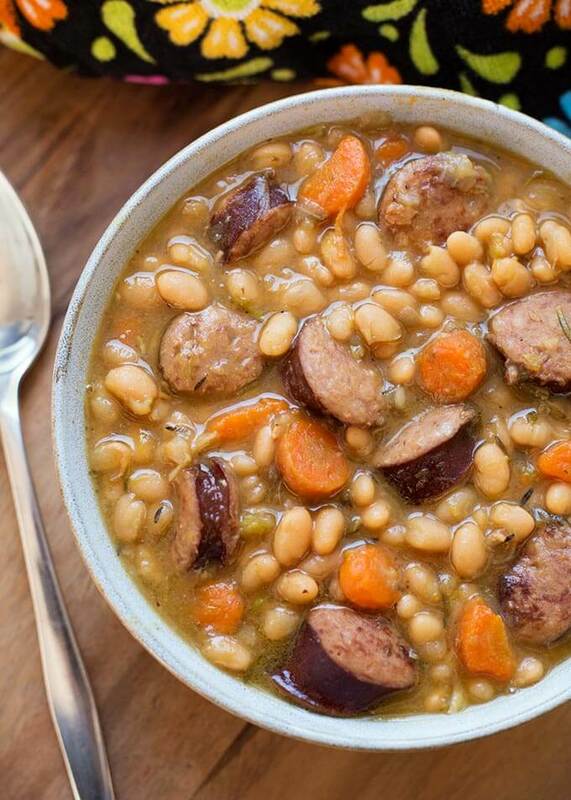 These pressure cooker sausage and beans recipe is a one-pot wonder! I never get tired of eating beans, and cooking beans in the Instant Pot® is truly a pleasure! They cook so much faster than any other method. If all I used this pressure cooker for was beans, it would still be worth it! 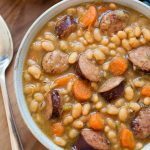 In this recipe for Instant Pot Sausage and White Beans I like to use kielbasa, for it’s smoky flavor. This sausage flavors the beans perfectly. Adding the fresh herbs, onion, garlic, and veggies takes this to a higher level! It just works to make this one-pot meal delicious as well as hearty. You can use canned beans for this recipe, but they cook so fast you will want to reduce the cook time to about 4 minutes. Canned white beans tend to fall apart easier than other varieties. If you decide you want to add in some fresh kale or baby spinach, add it in after the pressure cooking is finished. Just put several handfuls of the greens into the pot and stir into the beans. The residual heat will wilt them to perfection! Serve Instant Pot Sausage and White Beans with some crusty bread, and a side salad to make an even more complete meal. Though just a bowl of this is a meal for me! Well, that and the bread. I love bread! 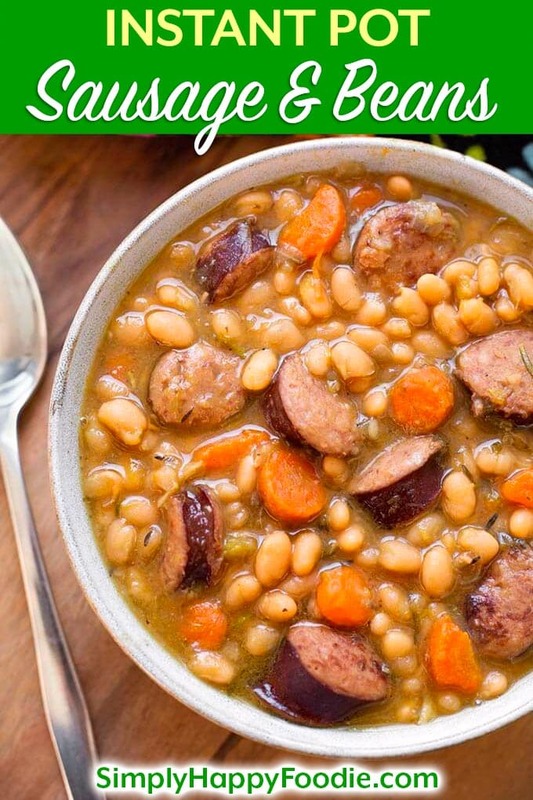 Instant Pot Sausage and White beans with smoky kielbasa or your favorite smoked sausage, onion, garlic, carrots, and white beans. 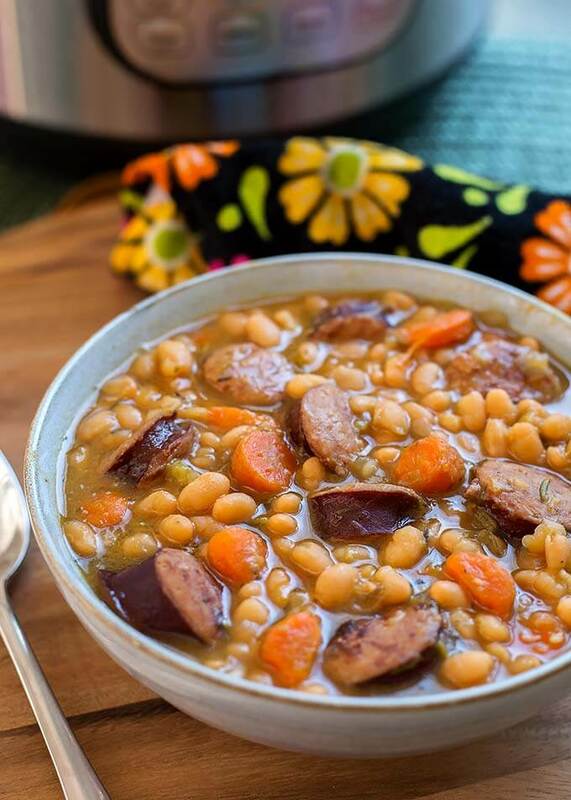 A tasty pressure cooker sausage and beans favorite. Turn the pot on to the Sauté setting. Let it heat up and add the olive oil. Then add the sausage. Let it sit and brown a few minutes, then stir. Lightly brown all sides. Add the onion, bay leaf, carrots and celery. Stir and cook until the onion starts to turn translucent. Make sure to scrape any brown bits from the bottom of the pot (deglaze). Add the thyme, rosemary, oregano, and garlic. Cook, stirring for 1 minute. Add the pepper, and broth. Stir, and then put a glass lid on the pot and let the contents come to a simmer. Once the broth is simmering, add the beans and stir. Put the pressure cooker lid on, lock in place, and set the steam release knob to the Sealing position. Cancel the sauté function and press Pressure Cook (or Manual) button or dial, and then the + or - button to choose 40 minutes. ** High pressure. The pot may take 10 minutes or so to come to pressure, but since the contents are already hot, it will pressurize quicker. Once the cooking cycle has finished, let the pot sit undisturbed for 20 minutes (20 minute Natural Release). Next, turn the steam release knob to the Venting position to release the remaining steam/pressure. Please use caution and do this in bursts at first. When the pin in the lid drops down, open the lid, facing away from your face, and set aside. Use a long handled spoon to gently stir the beans. Taste a few to test for tenderness and for salt, and add salt if needed. If beans aren't tender enough (sometimes old beans take longer), just put the lid back on and cook them for 5 more minutes under pressure, and a 10 to 15 minute natural release. If you are adding spinach or kale, stir it into the beans after pressure cooking and let the pot sit for a few minutes until the greens are wilted and soft. Serve. These beans are very good with some buttered crusty bread! *If you want to use canned white beans, rinse and drain them, add at the same time you would add the dry beans, and adjust broth to 4 cups, and cook time to 5 minutes, with a 10 minute natural release. Canned white beans are already soft, so they may break apart easily. **If you soaked your beans for at least 8 hours, adjust cook time to 25 minutes. ***Old beans will take longer to cook, so if you think yours may be old, soak them or prepare for a longer cook time. I made this last night with dry beans and it was delicious, thanks for the great recipe! Hi Cheryl, that’s great! Thank you for your review, and happy cooking! Hi Cathy, I do prefer to make this with the dry beans. It is good to have an option for a faster batch, hence the canned beans. I hope you like the dried bean version! Thank you for the review! Made tonight with the dried beans–delicious. Thank you for the recipe. Would this recipe work in a Duo Mini if ingredients were halved? Looks great! Can’t wait for more Mini Duo recipes on your site! Hi, yes, I think it would work great halved! I hope you like it! Tried this last night. Did the recipe with pinto bean instead of white beans. It was great. the flavor was perfect. I also added a ham hock. Would suggest fixing this. Very good. Hi Blaine, thank you for the review. Pintos are great, and ham hocks are so good, too! I’m glad you liked the recipe! Hi Babs, really any sausage is good. What I love is the smoky flavor of the kielbasa. But use what you have, and if your sausage isn’t smoked, try a teaspoon or more of smoked paprika if you want! Can this recipe be done in the oven instead of a presser cooker? Yes, I think in a Dutch oven, or even a crock pot. Absolutely Delicious! All the family loved it. I thickened it slightly with some cornflour and used a vegetable stock cube as well as a chicken stock cube. Hi Kathy, I’m so glad you and your family like this recipe! It’s a favorite over here, too! Thank you for your review! I followed the recipie and after the cooking cycle, my beans were hard!?! Old beans often take longer to cook. Awesome !! Tweeked a little to our taste but a great recipe!! Turned out great! It’s a keeper? I made this with garbanzo beans (chickpeas) because I happened to have a bag of them and it came out great! The broth was very nice: not creamy like you’d get with other beans but clear and golden. Made this tonight for dinner…delicious! Good balance of flavors and I add the kale as suggested. Will definitely make this again. Hi Karen! I’m so happy that you liked this! Thank you for letting me know! Can you please tell me how long and the setting I would use in a slow cooker! If you soak the beans first, Low for 7 hours or High for 4 hours. I’m not 100% sure, but I usually cook my soaked beans that long in the crock pot. This looks delicious! I’m planning to make it for dinner tonight. The only problem is, I pre-soaked 2 pounds of beans, instead of just 1. Do you think I could freeze the other pound to use later? I’ve never tried freezing soaked beans, but I did a little research for you and the answer is yes, just drain first! I made your recipe and it was so delicious. Will definitely be making it again! Thank you! I made a vegan version of this tonight using Field Roast Mexican Chipotle Sausage and it turned out amazing! I also topped with nutritional yeast. I don’t have a pressure cooker so just went with stove top. Can’t wait to try the split pea recipe and others mentioned! Hi Bethany, what a great adaptation of this recipe! This will help other Vegans make this is they want to! Thank you! Very good meal. It was my first time making dried beans in the Instant Pot and I was pleased with the results. I did find the meal a bit too salty though so next time I will omit salt and will probably put in half of the kielbasa. So glad you liked it. The saltiness will vary with the brand of kielbasa you use, as well as if you are using low sodium or regular broth. Hi- are there any adaptation to the receipe needed if you use cooked sausage? Hi Hilary, I think the sausage I use is precooked. Just cut the pieces thick and you should be good! I haven’t tried it yet but give you 5 stars just for the well written recipe. Looking forward to making it. Thak you, Cindy! I hope you like it! This soup is amazing!!! I used 2 can white beans in the crock pot on high 4 hours and it was a hit not one drop left!!! I’m going to try it this weekend with pinto beans! Hi Cherry, I’m so glad you liked this recipe! I love my slow cooker! Thanks for your review! I made this last night with just a couple modifications. First, I soaked the beans for about an hour before cooking. Second, before adding the beans, I removed most of the carrots/celery/onions/sausage. I did leave some in the pot to flavor the beans. That was simply a matter of personal preference since I like my veggies to not soften to the point of dissolving. I added them back after the beans were done (along with some chopped kale) and the residual heat cooked them through perfectly. Thank you for this great recipe – it’s a keeper. Would be great with ham, too! Sounds good! Thank you for your review! About buying them and using a little bit for one thing. So, when I made this recipe for the first time I took the leftover rosemary and thyme and froze them in ice cube trays in the amount the recipe calls for. So when I make this I just pop a ice cube out and throw it in the IP before before pressurizing. Works great and saves some $$ in the long run by not wasting those fresh herbs. Thanks for the recipe!! I’m so glad you like this recipe, Elizabeth! I love your tip about freezing the fresh herbs. They are not cheap, and it’s sad when they go bad before you can use them. Thank you! Just made this. Soaked my beans an hour before. Added a ham hock. Used 1/2 chicken andouille and 1/2 Aidell’s andouille. Made my own bone broth. Added kale at the end. Delicious!! Thank you! Sounds yummy! Thank you, Jamie! Hi! I tried this last night with dry beans and the beans were perfect texture. However, they had a really bad bitter aftertaste. Seems to be a problem in the skin. Any chance you know what could cause that and how I could fix it? Right now I am thinking on rinsing the beans under water, or add cream/sugar. Thanks! Hi, I don’t know what could be causing a bitterness in the beans. I have not heard of this happening before. Maybe they are old? Maybe the garlic burned? 5-Stars! (site wouldn’t select the star rating). SO good! I did soak the beans for a couple of hours before cooking (will try decreasing to 1 hour soak). Mine was thicker looking like the recipe photos (vs soupy looking on some Pinterst reviews). Used cajun andouille and it added a nice heat to the dish. Also added about 4c of chopped kale at the end. This would’ve taken all day to cook without the IP. Delicious! That’s great, Tara! Thank you. It looks like your stars came through. I appreciate your review!